1. Preheat the oven to 400F or get your barbecue ready. Arrange the asparagus on a baking sheet and drizzle with the oil. Stir to coat the asparagus with the oil. Season with salt and pepper. If baking, bake for 10 minutes. Shake the pan to turn the asparagus and bake for another 10 minutes, or until the asparagus is tender and roasted. If barbecueing, heat on medium until tender. 2. Meanwhile, prepare your quinoa: Bring water to a boil over high heat. Once boiling, add quinoa. Reduce the heat to low, cover and simmer until all of the liquid is absorbed, about 15-20 minutes. Keep covered for an additional 5 minutes to steam. Set aside. 3. Meanwhile, in a large bowl, place the lemon juice and zest, oil, garlic, salt and lemon pepper. Stir well to combine. 4. Once the asparagus is cooked, chop into 1″ pieces. 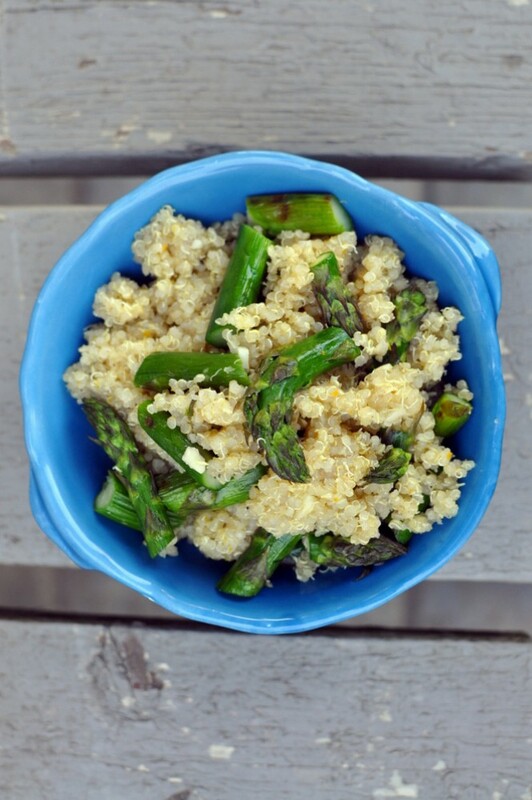 Add the asparagus and quinoa to the bowl with the dressing and stir together well. Season to taste. Serve warm, at room temperature, or cold. Serves 3-4 as a main, more as a side. When I bought the bowls they were already collapsed so I was confused until I realized they held way more stuff! 🙂 Sorry to hear you can’t digest garlic well.. gah! That look like some huge asparagus! I would definitely give up chocolate and keep the garlic. How else would I cook, since it’s in practically everything I make? 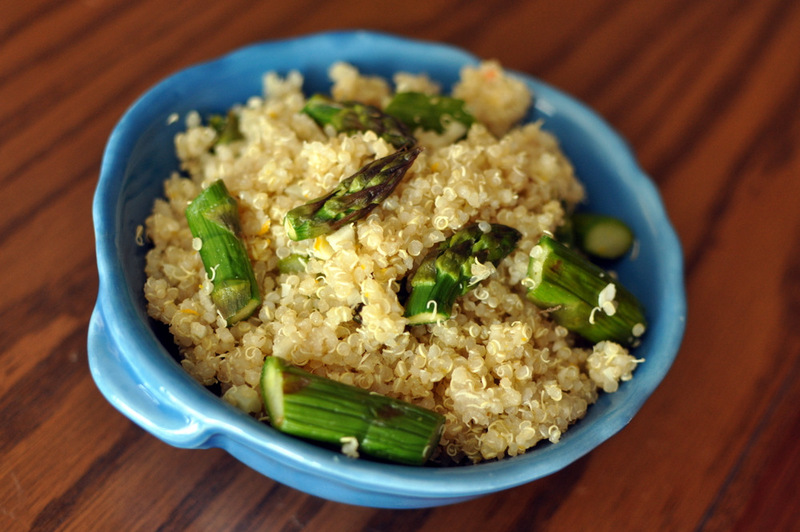 Asparagus, quinoa, and lemon–sounds like a perfect lunch! thank goodness I don’t have to make that choice—although garlic is definitely part of my day-to-day repertoire. Chocolate is more of a treat! Nice seasonal dish using the superfood, quinoa! Oh wow I can’t even IMAGINE what I’d choose! I eat garlic in almost everything…but I really adore chocolate! thank god I don’t really have to choose. I definitely couldn’t give up asparagus either though. LOVE IT! More yummy quinoa! This sounds like a simple side dish but I’m sure it still packs lots of flavour with the garlic and lemon. I can’t believe I still haven’t tried Ontario asparagus yet! I don’t think I could choose easily between the two but if I had to, much as I love chocolate, I would probably have to go with the garlic. 😉 I love all of the flavors in this salad–thanks for sharing it at Souper Sundays. I would definitely keep the garlic. Now if you asked me lemon or garlic – that would be a tough choice!! Definitely going to try this recipe this week. Oh my, garlic or lemon would be a difficult choice for me, too….. good thing I don’t have to choose! 🙂 Please let me know how you like it.